This topic contains 29 replies, has 8 voices, and was last updated by Darkest Star Games 1 week, 4 days ago. Had Charles Oines work on this while I attended to 6mm versions of the Garrhul grav tanks. All have been sent off to the printer! Hopefully my caster will get my last bit of new stuff wrapped up so he can then get on these! There is also a human Free Trader and Garrhul Raider Scout in the works, as well as “small craft”. On a design note, the few panel lines is intentional. In the DS ‘verse most of the major powers make use of “3d printing” type technology (but vastly superior of course), so large sections can be manufactured as single components then put together. 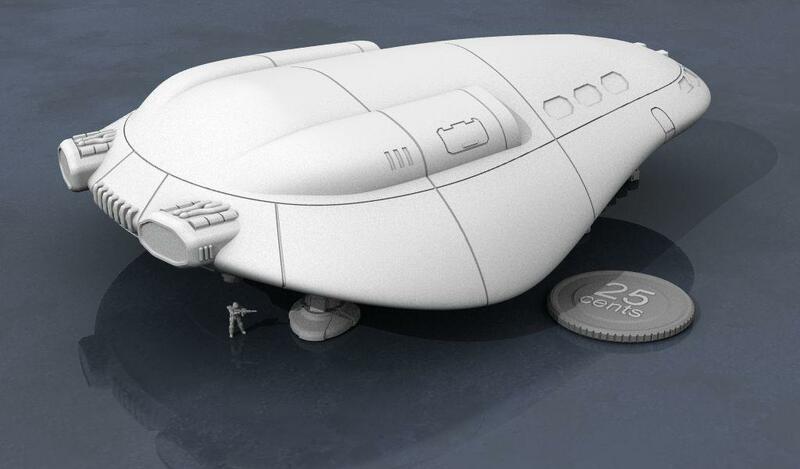 So this means that lower-tech vehicles and ships will have many more panel lines and greeblies than advanced ones. This topic was modified 5 months, 2 weeks ago by Darkest Star Games. I love it, I kiss it, it’s beautiful! No idea what I’d use it for but I’ve long wanted to build a Traveller-esque Force from DS models – I better start saving up! I would love to see that painted, but I fear to do it justice would mean an airbrush and masking tape and stencils. But how very pretty it would be. Reminds me a bit of Thunderbird 2. I love it, I kiss it, it’s beautiful! Thanks man! We had a lot of back and forth on this and I think it hits dead-on. 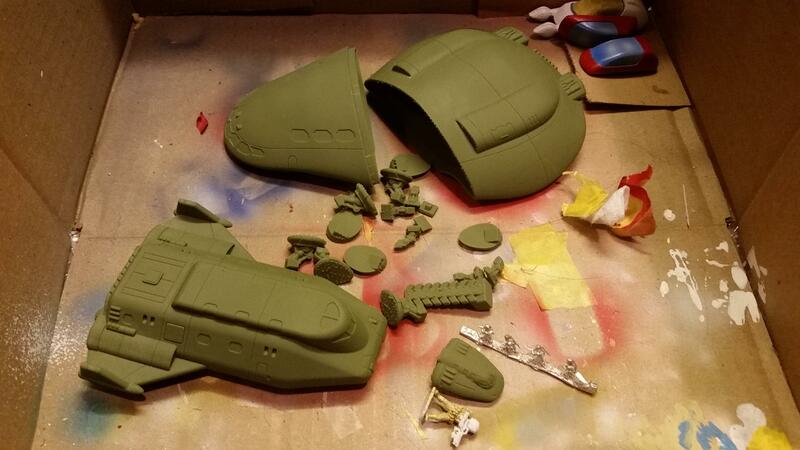 I would love to see that painted, but I fear to do it justice would mean an airbrush and masking tape and stencils. But how very pretty it would be. This ship (and it’s armed tender!) will be printed at the same time as the Venturian trader. Should end up being 10 parts (Hull, Tender, 4 landing gear, 4 gear doors). I can’t wait! 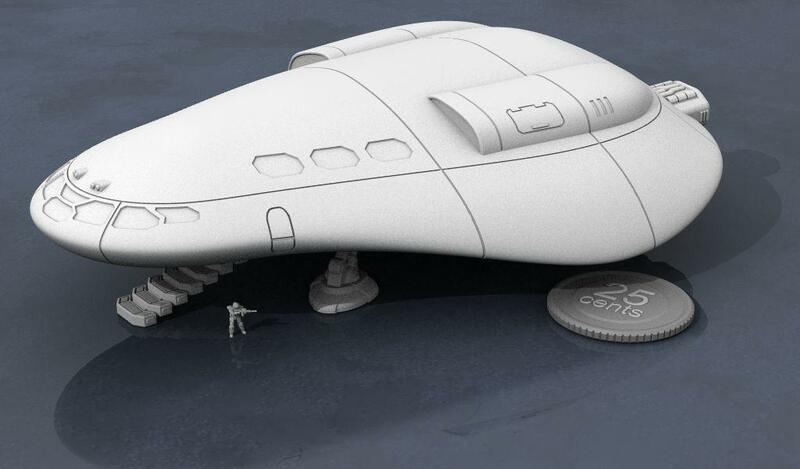 I’ve had it in mind to do a Traveller setup at 6mm scale for a long time – maybe this will be the year I do it! I just need to find someone at the club willing to play Striker. Striker will be a stretch for people into today’s games, not fast enough. But, if your toys are shiny enough i’m sure you can snag some poor soul! Striker and Classic Traveller are the only options! So mr Average where are YOU located? I am north of Toronto. Alas, I’m in the Eastern USA. So right now these are just 3D models you hope to market? Then the potential source for casting fell through. That is a bummer as I would love to have Traveller equipment for 6mm available. Keep us informed if this will be going through please. Traveller players are far and few between anymore, at least compared to 30+ years ago. When I got back into gaming a few years back one of my primary focii was updating Striker. I started a thread on TMP but was too new to the gaming life as it has evolved since then. My passion is for fire team to squad size units preferably with a single die roll for each team/squad. Not too practical so nw I have been looking at Force on Force just as some others have looked for other potential start points. I assume Tomorrow War is FoF with high tech equipment options much like Striker is a cross between Traveller, Mega Traveller AHL and Snapshot melded together. Much though I like 2D6 it becomes awkward rolling for multiple attacks simultaneously while rolling multiple and variable dice for grouped attacks as per FoF is easier to handle. So I am looking at a variation of it as a start with a lot of Striker’s options and organizations added in. It would be great to be closer, of course there are always cons where we could meet! Back in the day I used to attend 3 to 6 a year. They are both now at the printer, hopefully will get done by the end of the month. Caster is still a question, but I have 3 options at the moment, hoping my original guy gets going again real soon. There is a yearly TravellerCon you can hit. I believe it alternates between San Francisco and the east coast. Some of the folks that attend put on DS2 games as well as Striker and SnapShot. I went once about 15 years ago and had a hoot. Played in an RPG scenario for 17 hours straight, slept 4 hours, then played a fleet action for 7 hours whose result tied back to their FFW board game campaign. Loren Weisman was there as well as some of the older authors and contributors. Really enjoyed myself. Give it a visit if you get the chance, good people. I think I ran across that site sometime in the past, or some other con used the same engine. It looks like I got the 2018 site which was in Pennsylvania. So I assume it will be out west this year. If in PA I will have to go. I am glad you are pushing forward with your ships. I only game land and air in 6mm so these will make excellent objectives if nothing else.I have never role played in 6mm, and almost never in miniature. The times I did it always devolved into a wargame. Found out this weekend my flying buddy (RC planes) is big into sci fi so hopefully a new recruit………..
I’ve done some RPG lite in 6mm, and it’s a hoot. Sort of skirmishy, sort of RPG, using 5150. Will put up some AARs once I get these ships done. Had to split the Venturian Trader hull into 2 parts lastnight after hearing from the printer that it wouldn’t fit on his best machine. The final resin product will still be 1 piece though. DSG. I was going to do this as a PM but think others may be interested as well. Roughly when do you feel these may be available? I don’t mean what date but rather late this year, mid next, etc.. Thank you and they look excellent. The prints should be ready within 2 weeks (finally got a slot!). Getting them cast is all up to my caster, but I think I can put enough pressure on him to get them done 30days from when I hand him the models. I’m hoping before June. Prints are done! Should be in my hands by Wednesday. Sooo excited! Will post pictures ASAP. Too small for scale, or for your canon? This reply was modified 1 week, 5 days ago by Rhoderic. The third looks to me like it could be a “downship,” a small transfer craft for shuttling around just a few personnel at “bush” colonies with limited landing facilities. Personally I’d keep it. Ya, the shuttle piggybacks on the Fed Trader (it’s not a Subsidized Merchant at all, I swear!) on that little pad on the top. I wish the main and the shuttle were both about 25% larger (at least), as the Fed ship is only as large as a deodorant shtick and I wanted it to be shampoo bottle sized (and the doors are tiny looking). Guess there’s always room for more ships later! 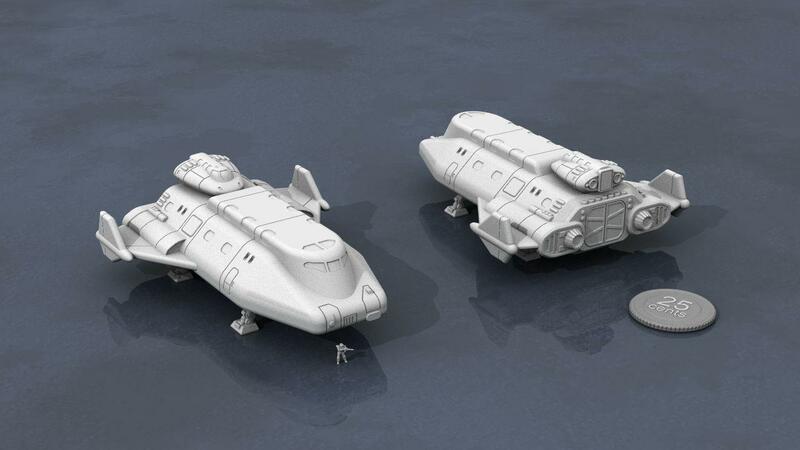 Next ships to be printed (in the few months future) will be a Varg… erm, *ahem*, Gahrrul Patrol Gunship and a Corsair! You mentioned 5150 in one of your above posts – this looks like quite interesting universe. But I´m completely unsure how all those books work together – there´s very little info on how they are related. Seems to me some are an older version and some a newer. And the THW website doesn´t help either. That little shuttle had always been my favorite, since seeing it in the render. Very nice smooth prints, very interested to see how well the two halves fit. I’ll be tempted to cut it horizontally and make interiors for the ships. Oh my….they look so good! :O You mentioned 5150 in one of your above posts – this looks like quite interesting universe. But I´m completely unsure how all those books work together – there´s very little info on how they are related. Seems to me some are an older version and some a newer. And the THW website doesn´t help either. And the THW website doesn´t help either. I’ll see if I can get Ed to make a synopsis or something. The different book cover different aspects of the universe, from fleet battles and straight platoon/company sized combat engagements to skirmish and RPGlite character campaigns. Much like Ivan does with his line there is indeed a bewildering array and even I (who does some writing for THW) have a hard time keeping track!. I generally use the base mechanics and stuff my own details in. These minis will also be featuring in a Traveller campaign later in the year, out in beyond District 268 and 5 sisters. I don’t think you’ll be able to build interiors for these guys, the production models are going to be solid resin! The build plate for the printer wasn’t large enough to do it in one go so that’s why it’s in 2 parts. Wish they could be caste hollow though, that’d save on shipping and materiel big time! Would that you could slice them horizontally and reveal a cutaway “deck” interior! Would have to be a prohibitive 15mm scale but still. O how the mind wanders.